When SUNY Geneseo Campus Auxiliary Service (CAS) engaged us the goal was to re-enliven a 1960’s freshman dining hall. “Our freshman dining hall wasn’t even on the college tour,” shared Mark Scott, Executive Director of SUNY Geneseo CAS. Together, we infused the dated space with an “Eat-Study-Play” theme and a design solution that transformed the separated 2-story building into a connected multi-story commons/satellite student center. It’s not uncommon for the project process to require change. Many projects require down-sizing to meet budgets and menu requirements; the trick is to look at innovative solutions to maintain both functional and aesthetic goals. Food service layouts often have to react to existing infrastructure, staffing and equipment flexibility in changing menus. Food service designers do a great job in advising how equipment can serve multiple purposes and service times, such as breakfast, lunch and dinner. “Flexible equipment items can be designed to allow for any production adjustments in menu offerings. For example, pizza ovens can be used for multiple products such as steak, fish and baked goods,” says Paul Cumpstey, Design Director of Kaizen Food Service Planning & Design. 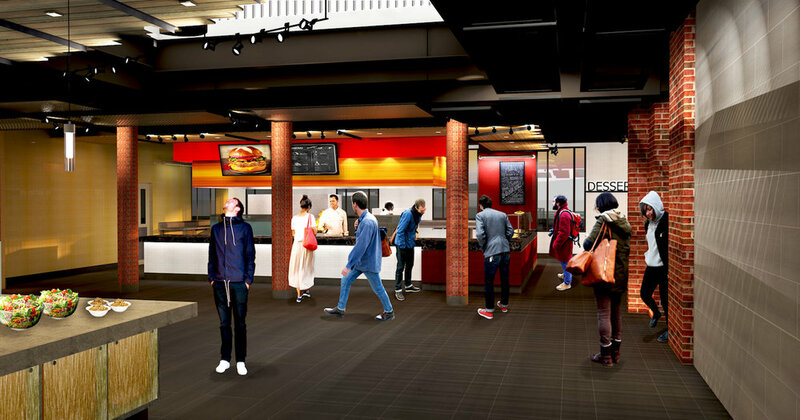 Discover how Edge can help your university not only reclaim your dining hall, but to create a destination. Contact us today.